For our example we are going to make an edit to the openaps docs. This does NOT need to be done in the linux environment on your rig. This can be done on any Windows PC, Mac, etc. (any computer with Internet access). Go to https://github.com/openaps/docs and hit Fork in the upper right to make your own copy of the repository. Go to http://openaps.readthedocs.io/en/latest/docs/introduction/index.html or similar and navigate to the page you want to edit. Click on the black box at bottom left of page with the green word “v: latest” or similar. 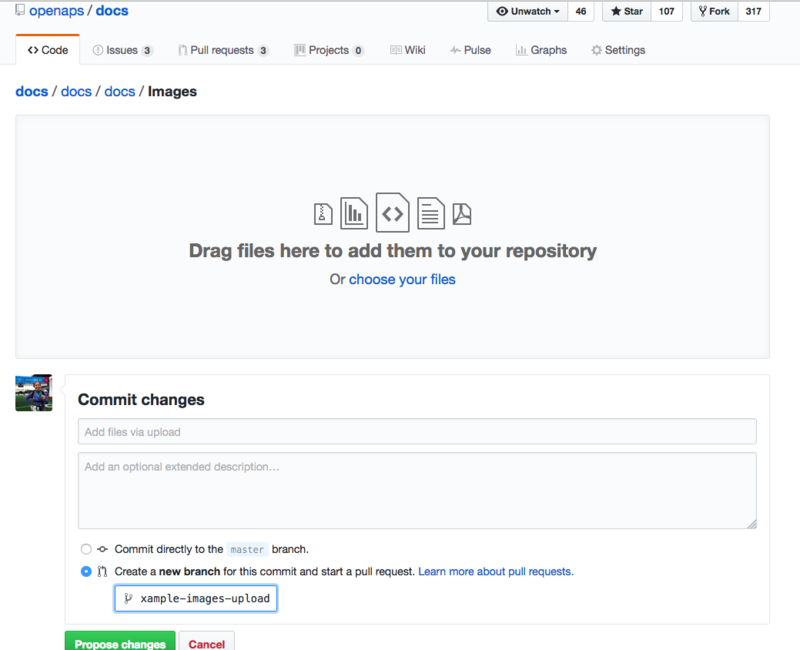 In the pop up window that appears, click the word “edit” for editing in GitHub. 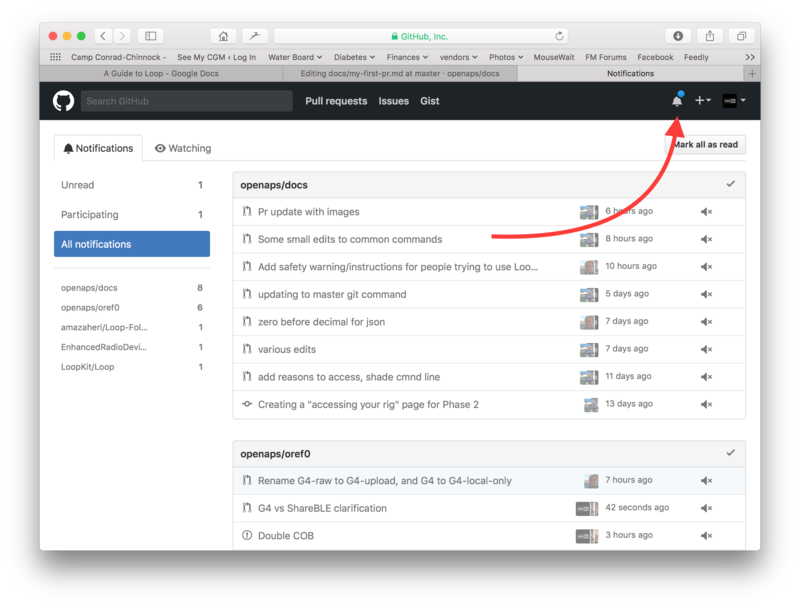 Or you can click on the “Edit in Github” link in the upper right corner, and then click the pencil icon that appears in the top bar of the page contents to be edited. That completes the opening of a pull request, PR. 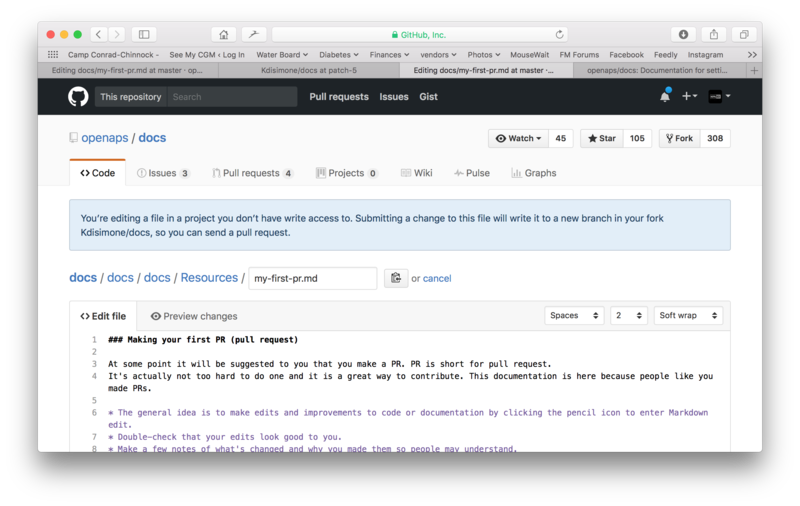 GitHub assigns the PR a number, located after the title and a hash mark. 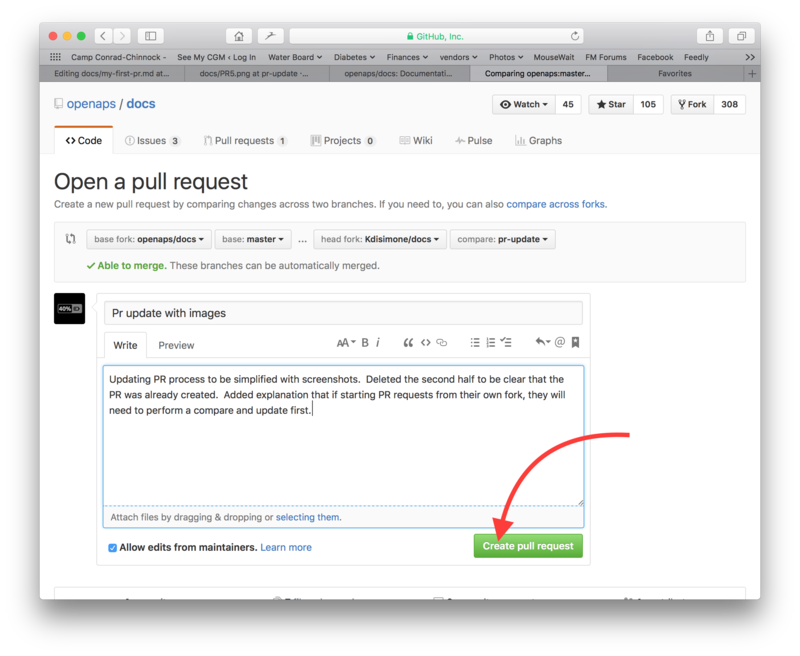 Return to this page to check for feedback (or, if you have Github notifications emailed to you, you will get emails notifying you of any activity on the PR). The edit will now be in a list of PR’s that the team will review and potentially give feedback on before committing to the main documentation for openaps! If you want to check on the progress of the PR, you can click on the bell logo in the upper right corner of your GitHub account and see all your PRs. PS, your fork and branch will still be sitting on your own personal GitHub account. 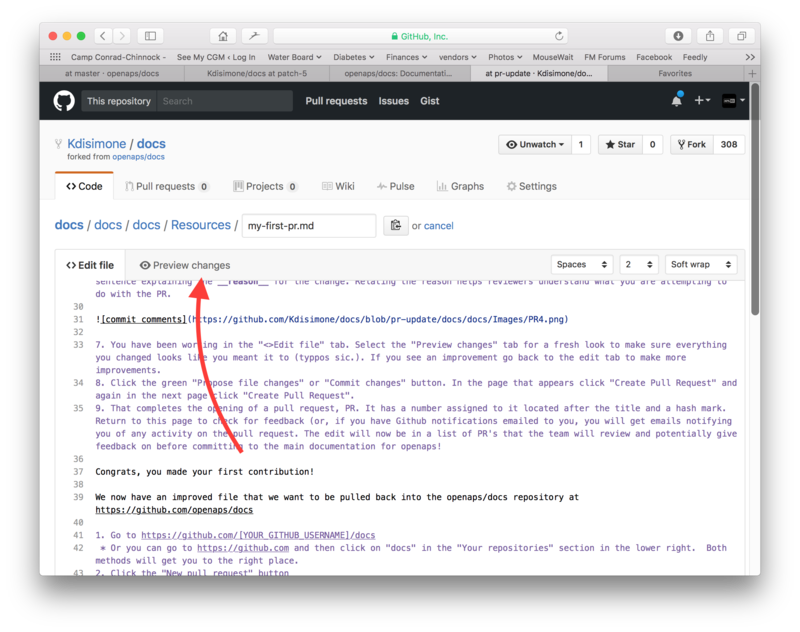 After you get a notification that your PR has been merged, you can delete your branch if you are done with it (Step 8’s notification area will provide a link to delete the branch once it has been closed or merged). For future edits, if you follow this procedure the edits will always start with an updated version of the openaps repositories. If you choose to use another method to start a PR request (e.g., editing starting from your forked repo’s master branch as the starting point), you will need to ensure your repo is up-to-date by performing a “compare” first and merging in any updates that have happened since you last updated your fork. 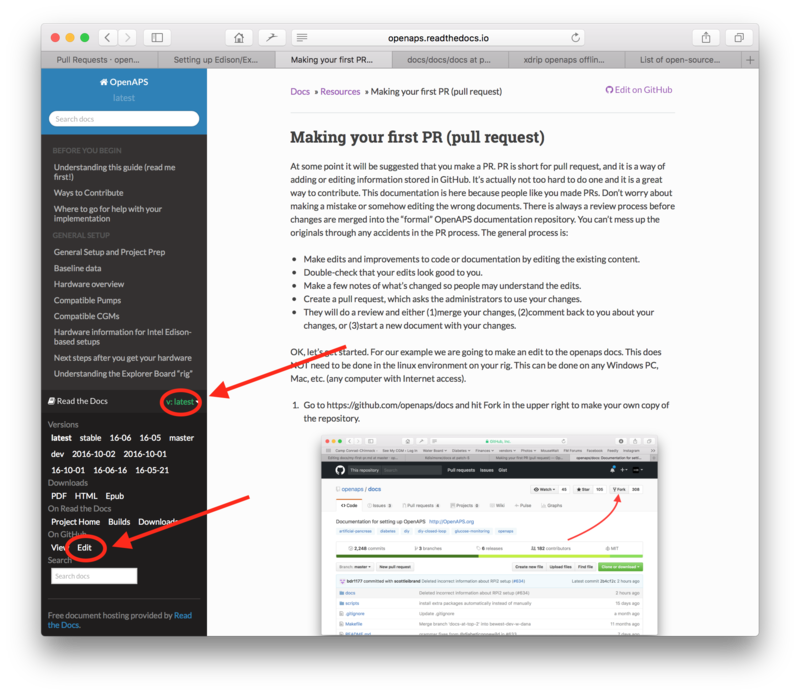 Since people tend to forget to update their repos, we recommend using the PR process outlined above until you get familiar with performing “compares”. Navigate to the images folder (https://github.com/openaps/docs/tree/master/docs/docs/Images - but make sure you are in your fork/copy of the docs Images folder to be able to do this (replace “openaps” in the URL with your github username)). Now, you can look for the URL/relative path of each file (example, you can see this individual image has its own URL and path and use that to refer to when adding images into a page in the documentation. 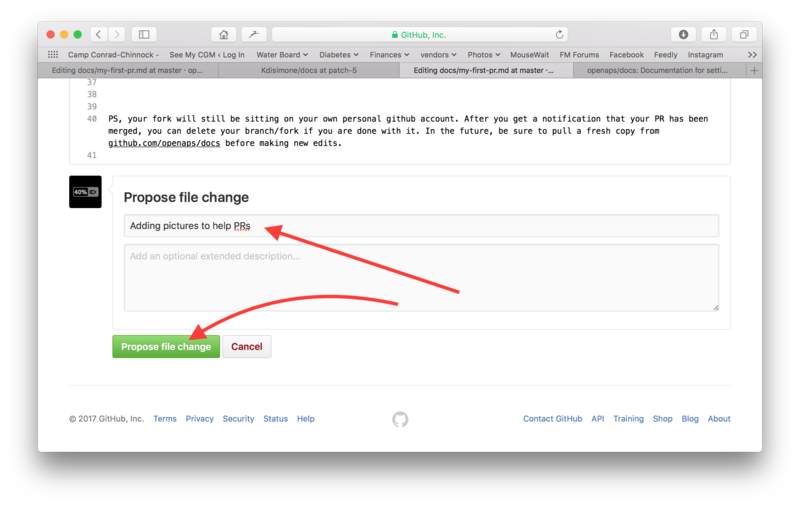 Now, once done adding images/making adjustments, you can submit a PR back to the master copy of the OpenAPS docs.